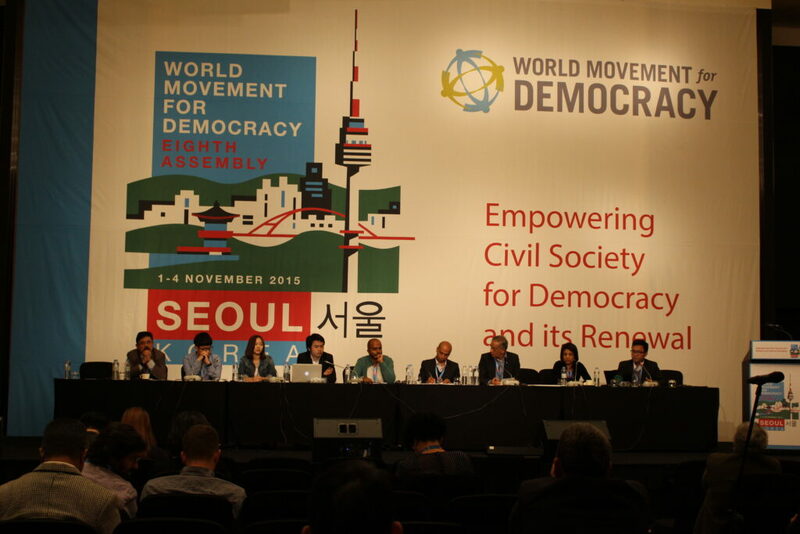 (November 2, 2015, Seoul, Korea) – Organized by the Asia Democracy Network (ADN), the regional workshop for Asia, Asia Democracy Forum (ADF), took place from 14:45 to 18:15 on November 2, 2015 (Monday) in Seoul, Korea. Attended by approximately 100 participants mostly from Asia and some from other continents, the Regional Workshop for Asia discussed the state of democracy in Asia by identifying the challenges and exploring the opportunities for civil society in Asia. The Workshop also highlighted the voices from the so-called democratic hot spots where people’s struggles for democracy are ongoing. The time schedule of the Forum is available here. The current situations for the civil society seem dauntingly common in many countries across Asia. With the rise of democratic assault in the region of Asia, it was found important for the civil society actors to brainstorm feasible collective actions and share ideas and experiences to ensure the space for the civil society in the region. The first presentation by Ms. Evelyn Balais Serrano was to present the outcomes from the series of the workshop on the Future of Human Rights and Democracy in Asia as a joint activity. The emerging challenges identified from the workshops are the followings: shrinking civic space, crackdown on human rights defenders; migration, human trafficking, refugees; inequality and poverty; rise of ethnic and religious intolerance; business and human rights; climate change; impunity; militarization and armed conflicts. On the other hand, the opportunities were presented such as increase in people’s initiatives and use of social media, establishment of other human rights mechanisms, more inclusive participation of youth, women, SOGIE group, indigenous people and other marginalized groups. Her presentation is available here. Anselmo Lee, co-convener of the Asia Democracy Network (ADN) gave a brief introduction to the ADN and reasoned that despite the differences among the countries we need a platform like the ADN in the region to promote democracy by working together and deal with the cross-cutting issues at various levels. He further highlighted that democracy has to be more comprehensive in ways to engage with development and climate issues. – Lack of broad vision to deal with the cross-cutting issues and collaboration with the other marginalized groups. – Coalition-building and networking of the actors from the grassroot level to the national and to the international level. – More effective campaigns and advocacy from the broader perspective to magnify the power of the people. – Work on the cross-cutting issues with inclusive approaches to the marginalized groups of the women, the disabled, the youth, the SOGIE, the ethnic and religious minorities. The second session highlighted real stories from the so-called “democratic hotspots” in Asia such as Maldives, Myanmar, Thailand, Cambodia, Malaysia, Vietnam, and Hong Kong. This session focused on the youth movement and young people’s struggles with democracy in the respective countries. The speakers shared their experiences of their involvement with the movement from the Maldivian people’s struggles with the authoritarian power to Hong Kong’s pro-democracy Umbrella Movement. The participants recognized that it is extremely important to encourage young people to keep their momentum in their movement and collaborate more through bilateral and/or regional solidarity.